There’s something of a disconnect between the headlines today and the reality. We shouldn’t get carried away. New options for payment of fares will supplement smartcards, not replace them. London and other cities have led the way here, with the London Oyster system’s contactless payment option. I used it in July, and it’s incredibly useful. It won’t work the same way in Melbourne. I’m hearing the initial trial involves phones rather than credit cards, as the technology is a closer match to what’s deployed with Myki. The Herald Sun reports that the Victorian trial will initially be on E-class trams, which indicates the newer Vix Myki readers that are installed on that fleet (as well as in some stations) will be involved. So it doesn’t require scrapping the entire Myki system. The question will be whether this functionality can be retrofitted to older Myki equipment, or whether all readers need to be replaced to roll out the enhancements networkwide. Transport for London calls their Paywave/Paypass credit card payment option “contactless“. It sits alongside the smartcards, it doesn’t replace them. Even adding phone payment options, some users such as children won’t have any of options available, and will always need smartcards. The credit card functionality is programmed into the smartcard equipment, reflecting that the basic technology is the same — which is one reason why Myki cards often don’t work well when credit cards are nearby. Users touch on and off as normal at the Oyster gates and readers with their Paypass/Paywave credit card. The system accepts most local and overseas cards, which is an absolute boon for tourists — as well as other occasional users. It assumes you’ll be good for the first trip when you touch-on. This avoids a time consuming back-to-base credit check that may not be possible on a bus if there’s no connectivity at that instant. If there’s a failure of some kind, your card won’t work on the next trip. They track your touches around the system during the day, then the next day charge the total fare to your bank credit card account, subject to which zones you travelled in and daily caps. The fares are identical to Oyster card pay-as-you-go (the equivalent of Myki Money). 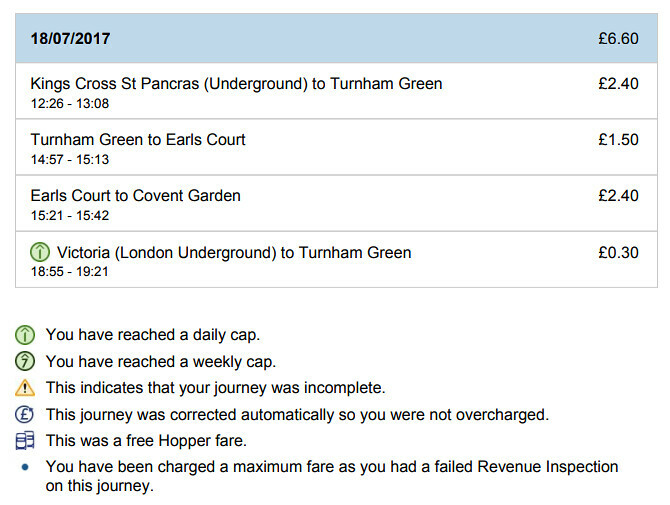 There’s also a weekly fare cap, to ensure you’re not paying more than the Weekly Travelcard rate. However London’s contactless option isn’t capable of handling longer season passes such as Monthly fares. It also doesn’t handle any type of discount/concession fare. Those are all still on Oyster cards. Ticket inspectors have portable readers, similar to those currently used by Victoria’s Authorised Officers, that can see the status of your credit card, and whether it was touched-on. We got ours checked on a London suburban train. The exception seems to be river boats, where a member of staff must see you touch-in. I’m not sure whether the credit card providers have had to make big changes to accommodate these systems, but even if so, you wouldn’t think they mind one little bit if it helps them get all those transactions via their cards instead of cards issued by the public transport authorities. Possibly they’re also getting a transaction fee or some other type of cut. It also helps the public transport authorities, as a lot of the headaches of issuing their own cards reduce in magnitude, they need less ticket machines, and they gain access to potential customers who don’t want to buy a PT card. The important thing here is that it’s an option. People who value their privacy and prefer an unregistered smartcard, topped-up only using cash, can continue to do so. People who don’t have credit cards can still use smartcards. What exactly the Melbourne trials will involve hasn’t been announced yet. It’ll be interesting to watch. Meanwhile, other enhancements that could be made to Myki include: weekly and monthly capping (once planned, never implemented), differing touch-on and off sounds to reduce confusion, finally eliminating unwanted ticket machine receipts, and continuing roll-out of the faster readers. Other questions? Leave a comment. Interestingly, while contactless supports weekly caps, Oyster doesn’t (yet). Something as simple as, being able to use my MyKi in Sydney and Brisbane, would be a major advancement in deed. We used our Oyster cards on the Thames Clipper about 18 months ago. Following instructions, we also had to wait for a staff member to see us touch on. So this wasn’t related to the credit card/app ticket. We have been talking about this for years. I have had a few chats with some of the hardware guys and payment system guys (I work at a bank). They could be blocking all non-MyKi cards at the terminal – hence only the modern readers (I presume they need to update the firmware locally of the old readers?) But the back-end integration to allow generic paypass/paywave would be a major change if it was not thought of originally (which it wasn’t!) The concept is simple – take money from an external source rather than from the internal database. I presume it is a big monolithic system. – PayPass/paywave are abandoned terms now. Visa/AMEX/MasterCard have all agreed on the term “Contactless” so this isn’t a UK only thing. – it’s not just Melbourne / VIC. Sydney is already under trial (Manly Ferry MasterCard only) and Queensland are doing something similar. Singapore are also having a trial with Singapore-issued MasterCard only. Why MasterCard? Because it allows for local storage to the card. In Chicago, their mass transit Ventra contactless payment system is a Mastercard debit card. So you could use the card for regular contactless payments (which are not common) as well public transport. While the public transit readers accept all contactless bank-issued cards using a pay-as-you-go type fare. The interesting thing the Ventra card had two accounts tied to it, an optional bank debit account and a transit account. They have since dropped the debit account functionality possibly due to a lack of popularity. Trust Herald Sun to only get half the story! Similar articles appeared in the Sydney press about Opal and also about as far off the mark as this one. I’m all for options, I’d prefer to keep my myki separate to any credit card/phone app. I use a yearly ticket, and it doesn’t sound like this would be replacing that. Sounds like News Ltd papers continuing their campaign against public transport. Google “gocard courier mail”, “opal card daily telegraph” and “myki herald sun”. Another point not mentioned is that contactless only works for full fare customers. Concession fares still require the use of the relevant smartcard such as Oyster. In relation to weekly caps you just load a 7 day travelcard onto Oyster which is the same amount as the contactless weekly cap. Why can Myki not be like a supermarket checkout that automatically gives you a discount if you buy 2 bottles of Powerade or travel 5 days in a row?